You’re probably familiar with Talking Tom, a cat that managed to get into millions of phones all over the world. The cat is funny, cute, and easy to like, and now he and his company will help you make your own summer camp. Talking Tom Camp is the latest title in the Talking Tom series, in which you must build your base (summer camp), surround it with defenses so other players skip your base when deciding which summer camp to invade, and try making puddles out of as many camps as you can. The game features cute graphics, and even cuter cat troops equipped with various forms of water guns, instead of real guns, which are used for transforming buildings into puddles and making enemies run away after they become soaking wet. 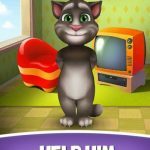 Talking Tom Camp can be an easy game to get into, and if you want to gather lots of coins and energy, enough for upgrading all of your buildings and training lots of kitten troops, you can do it relatively easy. In just a couple of days, your summer camp can become an unbreakable fortress with huge coin and energy production and lots of different defensive constructions. In this Talking Tom Camp guide we will explain to you how to build and upgrade your summer camp in a quick and easy way, how to protect it and keep it safe from other players, along with sharing tactics for invading other players’ camps. Stay with us and find out how to make the coolest Talking Tom Camp out of them all! 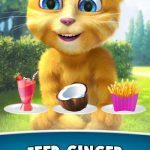 In Talking Tom Camp you have to build and defend your own summer camp. The process of transforming it from a simple tree house on an empty grass field, to an impenetrable fortress that hosts lots of production buildings and will attract lots of enemies (who will, most of them, give up from attacking once they see your defenses) can be completed in just a couple of simple steps. The first part of the process is building coin and energy factories and upgrading them. Coins and energy needed for upgrading factories can be won by playing single player missions. The first part of the single-player campaign can be played, all you have to do is to build a troop training grounds, which is relatively cheap to erect. So, first build coin and energy factories and then erect troop training grounds. Then you should beat all the available missions in the single-player campaign (don’t upgrade training grounds to unlock the next part of the campaign, this can be unlocked later when you have surplus energy and coins), and with resources earned from missions, you can upgrade factories. After this, you should focus on defenses. Since you can be attacked only from the road, defensive buildings should be placed close to the road, keeping other building safe behind them. Build all available defensive structures and place them in a way that once enemies close in, they are shot from all defenses at once. Next, it is time to upgrade your tree house and to build two coin storages and one energy storage. After this train max number of units and attack other players’ bases (we will explain how to guide your troops a bit later) in order to get some coins and energy. 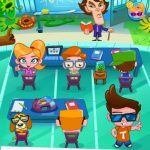 You should upgrade energy factories first because energy is more important than coins, and in order to upgrade your tree house to level 3 (which is the last step of constructing a powerful summer camp) you should upgrade coin storages. Don’t look at the price, just upgrade them because with your treehouse becoming level 3 you will get access to lots of important upgrades and lots of new constructions to build. It is also important to upgrade your minibus so it can take more troops (upgrade it once or twice, until it becomes capable to carry 20 of basic kittens armed with water guns), and to upgrade training grounds so you can play new single-player missions. But, wait to upgrade your tree house before upgrading training grounds, because you don’t really need advanced troops and you can get lots of resources by invading other players’ bases. Once your tree house reaches level 3, your base will receive more slots of defensive structures, which should be constructed right away. Again, defense is very important in keeping other players’ away from your summer camp, and you should build new defenses as soon as you get access to them. The catapult is extremely powerful defensive structure and even if it costs 35,000 coins, it is worth it. Just place it in a way that it covers the attack route (from the road) and at the same time that it is capable of covering the better part of your base. Okay, once you upgrade the tree house to level 3 and build all new defenses, your summer camp should be ready to repel any attack and it should also be capable to produce lots of resources so you can train new troops and build and upgrade new constructions. Talking Tom Camp gives you a couple of hundred of gems (the game’s premium currency), and you can decide whether you’ll save them up for getting another worker, or spending them in order to build your summer camp faster. We advise you to spend them because, while one extra worker sounds helpful, they won’t really matter because they cost 500 gems, and by the time you manage to buy one (unless you want to spend real money in buying gems, of course) your buildings will take hours to upgrade with those upgrades being so expensive that you probably wouldn’t have enough resources to upgrade two buildings at the same time, meaning that the better strategy is spending gems in quickly developing your base. This way you will be able to reach tree house level 3 way faster and enter a peaceful part of the game where you should worry only about your resource production, defenses, and attacking other players. Talking Tom Camp features battles fought with water guns, with defeated party running away crying and soaking wet. If you don’t want to end up crying, follow these rules. First of all, since in Talking Tom Camp all of your surviving troops can be used in new attacks, opposed to many other games where all your attacking troops will be spent, no matter whether they survive the battle or not, you should deploy all of them, always. This way defenses will have more targets and your kitten soldiers will have more chance to stay dry. Next, upgrade your minibus (troop transport) so it can accommodate 20 basic troops. 20 basic soldiers can really make havoc out of almost any base, even those with four or five defensive buildings. Just make sure to deploy them near the first defense, and then use the rally option making them attack other defenses. The rally option is extremely important to use because, once they destroy the first defense, your troops will just scatter around, making defenses easy to splash them. You should use rally for all defenses until they aren’t any more left. Then, just let your troops finish the base. When choosing which base to attack, avoid those that have a small number of resources stashed and lots of defenses, they just aren’t worth it. Next, you can attack bases that have lots of defenses, only if they have lots of resources and an attacking route that allows you to first destroy resource buildings and attack defenses only once resource structures are down. This way, even if you lose all of your troops and lose the battle, you will gather lots of resources, and that’s more important than getting three stars for a successful attack. And finally, basic troops are more than enough for most attacks because they have relatively high HP and while they attack numbers are low, 20 of them will make a proper havoc out of most bases. And the thing is, advanced troops take more space in the bus, meaning you can take fewer troops when invading. This means that defenses will have fewer targets, making it easier to eliminate your kitten soldiers, and even if they have a stronger attack, they will be destroyed by defenses. So, it is better to upgrade your bus to accommodate more troops and train only basic soldiers than to train advanced troops. You Talking Tom Camp should be tightly packed. Clear out all plants and trees and make sure that your buildings are placed next to one another, with defenses placed on outside border that touches the road, the only side from which enemies can attack you. And after you build a couple of new buildings, or after you gain access to new defensive structures, make sure to rework your base layout from the ground up. Okay, guys, that’s all for now. We hope this guide helped you in laying grounds to your own Talking Tom Camp, and that with our advice you managed to build a powerful camp that isn’t bugged by invaders and that can produce enough resources enabling you, in combination with resources gained from invading other players, to build new constructions and upgrade the current ones. 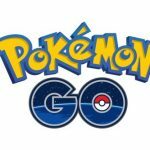 Thanks for reading and happy gaming!